Aragonese Castle stands on a volcanic rocky islet that connects to the larger island of Ischia by a causeway (Ponte Aragonese). 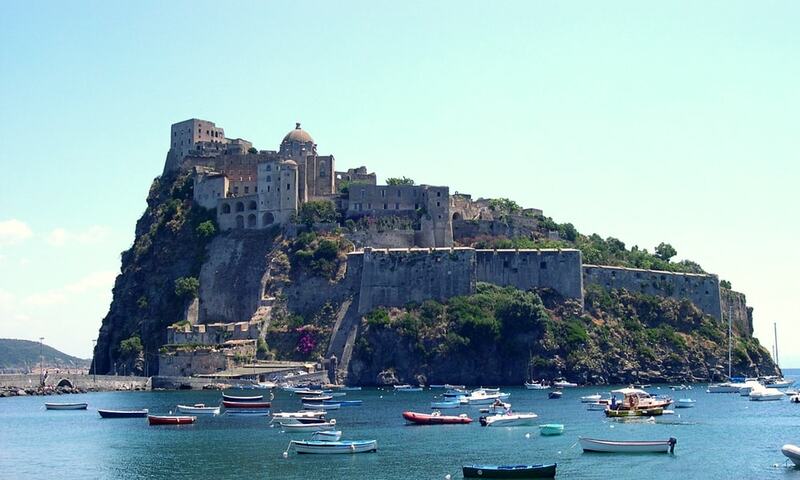 The Aragonese Castle is the most impressive historical monument in Ischia, built by Hiero I of Syracuse in 474 BC. At the same time, two towers were built to control enemy fleets' movements. In 326 BC the fortress was captured by Romans, and later by the Parthenopeans (the ancient inhabitants of Naples). In 1441 Alfonso V of Aragon connected the rock to the island with a stone bridge instead of the prior wood bridge, and fortified the walls in order to defend the inhabitants against the raids of pirates. Today the castle is the most visited monument of the island. It is accessed through a tunnel with large openings which let the light enter. A more comfortable access is also possible with a modern lif.